The 18 Days comprehensive Safari in Uganda as the name suggests features an extended encounter allowing you to explore a range of Uganda safari sites in detail. The 18 Days Safari commences and ends in Entebbe incorporating adventure, culture, wildlife, primates like gorillas and chimpanzees, recreation and the famous Prime Safaris Africa Home Experience. The destinations featured include; Jinja which is the source of the world’s longest River and a haven for white water rafting, Ziwa Rhino Sanctuary for Rhino tracking, Murchison Falls National Park for sightseeing,the Nile Launch Cruise for sights of Nile crocodiles, Hippos and Shoebill stork, Kibale National Park for chimpanzee trekking, Mpanga tea estates for cycling, Rwenzori Mountains and Virunga Volcanoes for adventure mountain climbing, Semliki National Park for the Sempaya hot spring tour, Queen Elizabeth National Park for tree climbing lions and the Kazinga Channel, Bwindi Impenetrable National Park for tracking the critically endangered mountain gorillas, the Lake Bunyonyi for recreational encounter, Lake Mburo National Park for magical savannah game including the Impala antelope, eland, Rothschild giraffe, Topis, Burchell’s Zebra among others and the cultural tours to the Banyankole community, Batwa of Ntandi and Bakonzo of Rwenzori. The Prime Safaris Africa Home Experience presents an authentic experiential touch of the local African homestead. 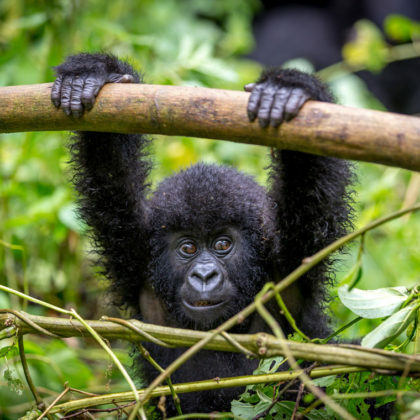 The 8 Days Uganda Rwanda Gorilla Safari takes you through the impressive countryside landscapes of Uganda and Rwanda providing a perfect escape from the daily bustling life that most people are always accustomed to. 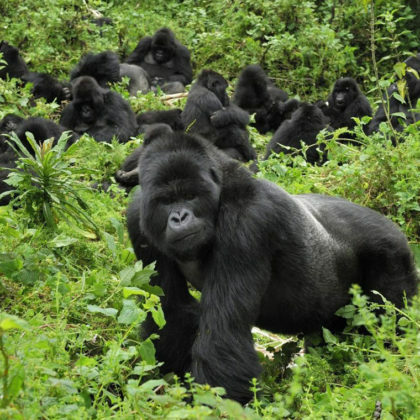 The safari incorporates double gorilla trekking in Uganda and Rwanda in the respective parks of Volcanoes and Bwindi, golden Monkey tracking in Mgahinga Gorilla National Park, recreational boat cruise on Lake Bunyonyi and rewarding wild game viewing in Queen Elizabeth National Park including the tree climbing lions, elephants, Buffaloes among others not forgetting the aquatics of the Kazinga Channel namely the Hippos and the Nile Crocodiles. 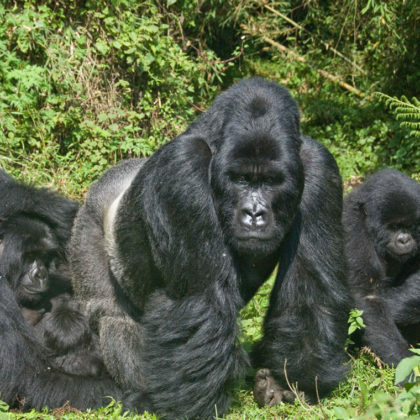 This 13 day Encounter in the shadows of Virunga and Rwenzori Mountains offers Gorilla trekking, Chimpanzee tracking and wild life game drives coupled with amazing scenery. Ziwa Rhino Sanctuary, Murchison Falls, Lake Mburo and Queen Elizabeth National Parks including the Big five of land animals, chimpanzee trekking in Kibale National park dubbed the primate capital of the world, the gorilla trekking in Bwindi Impenetrable National Park and recreation encounter on Lake Bunyonyi dubbed the lake of a thousand hills. Experience the traditional lifestyle of the Ankole and the Munyankole pastoralists.